I have been accused of being cheap, stingy, fugal, prudent, economical, thrifty, abstemious, tight, miserly, and even penny-pinching…mostly by my parents…and my children…and anyone else who has known me for more than 2 ½ weeks. People tend to exaggerate. I have been known to negotiate the price of such items as cars, Legos, bicycles, coffee, pizza, mirrors, tires, a globe, a skateboard, shoes…really…pretty much anything. On one such occasion, I was able to get Walmart to take an extra $75 off of an edge trimmer. On another opportunity, I purchased a Carhart coat, where I walked out of the store $5 richer than when I entered, and I once successfully negotiated the price of a bicycle from costing $75 to where the seller was offering to pay me $75 just to take it. “You have no pride!” Sarah has told me on more than one occasion…one being as I stood at the Cabelas’ customer service counter while the associate handed me a brand new Leatherman in which I paid a total of $0. It’s not that I don’t want to be generous…it’s more that I would rather give as much as I can…while spending as little as possible. There are three secrets to my successful negotiations. First, you have to be willing to ask. Second, you have to be willing to beg. Third, you have to be willing to walk away. Craigslist is a dangerous place for people like me. You find people practically begging for you to offer them insultingly low prices…and then asking if they would deliver it to you. I stared at her for a long moment, until I came up with a snappy come back… “Oh,” I said. I quickly turned to Craigslist and was quickly left with my jaw gaping at the asking prices of these instruments. 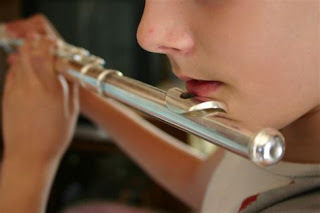 Shouldn’t an “open holed” flute be less money, since there is actually “less” metal used in the flute? Apparently the rest of the world does not see eye to eye with me on this issue. For the next several months, I continually scanned Craigslist, looking for a great deal. Finally, one came through that had some potential. Comparatively, as to what I had been encountering…this person was asking about 75% less than they could have been asking. It was a steal! Those of us who believe in Jesus, have been given the gift of grace…in salvation…but then also in gifts of grace from the Spirit. The Spirit gives gifts that are all…and totally…undeserved. We have done nothing to earn these gifts…yet, as in salvation and forgiveness…they are given freely. Now my daughter is using her gift…and it is beautiful! The rest of my children received “different” gifts this past Christmas…no one else got a flute. That’s the way it is with God…1 Cor. 12:11, says that the Spirit gives to us gifts…each is different…but He gives as He sees best…and He gives generously…to point to who He is…His character…His love…they are His gifts…to us.